The film is based on the Hugo Award winning novellette by Isaac Asimov (which was later expanded into the novel "The Positronic Man" by Asimov and Robert Silverberg). Robin Williams plays the android Andrew Martin, Embeth Davidtz stars in a dual role as Little Miss Amanda Martin/Portia Charney (Andrew's multi-generational love interest), Sam Neill as "Sir" Richard Martin (Andrew's original owner) and Oliver Platt as Rupert Burns, who will help Andrew take the steps necessary to be human. Directed by Chris Columbus, who had previously worked with Robin Williams on Mrs. Doubtfire. 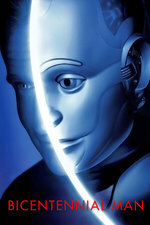 Roger Ebert: "Bicentennial Man" begins with promise, proceeds in fits and starts, and finally sinks into a cornball drone of greeting-card sentiment. Robin Williams spends the first half of the film encased in a metallic robot suit, and when he emerges, the script turns robotic instead. What a letdown. Stephen Holden, New York Times: But as it lumbers toward a mystical romantic ending in an early-23rd-century hospital, ''Bicentennial Man'' achieves the pop grandiloquence of a ''Star Trek'' installment. In its warm, fuzzy, self-congratulatory humanistic vision, nothing in the universe beats being a flesh-and-blood mortal. Todd McCarthy, Variety: The same story could easily have been told so that its themes would have hit home in sharp and meaningful ways. But Columbus’ approach is intended to cloak such topics as mortality and human identity in the warm glow of greeting card sentiment, which renders the prescription palatable for mass consumption but hopelessly diluted. This post is part of the Robin Williams Movie Club. I love this movie, regardless of what the critics say. Yes, the ending is schmaltzy, but there are deep and profound questions asked. I can't help but think that the critics missed the point a bit on this one. I think part of the problem with this period of Robin's career is that he was really cranking movies out; he was appearing in 2-3 movies a year (1997 - Father's Day, Flubber, Good Will Hunting; 1998 - What Dreams May Come, Patch Adams; 1999 - Jakob the Liar, Bicentennial Man) and it was just too much. Awwww, it's not on iTunes. The thing that always bugged me about this movie isn't the schmaltz, it's the female character that only seems to exist as an emotional prize for the male protagonist. He stalked what, 3 generations of that family til the daughter would finally sleep with him and noone thinks that's the slightest bit creepy? If the movie is asking the question about what it means to be human the answer it arrives at is, sure we can accept a robot as a human. A woman, not so much.